As mentioned in my post about my Steam Holiday Sale Haul, I grabbed Draw a Stickman for only a dollar, so it was pretty cheap. 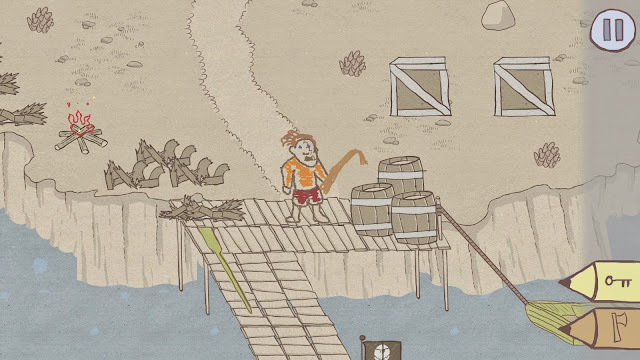 Admittedly, this game is basically a mobile game and wasn't really that expensive to begin with ($5 USD normally) but there were other reasons I wanted this game; I thought the ability to draw your own tools and weapons seemed like a neat concept as well as your own stickman - something that kids would especially enjoy. It turned out my daughter was a bit too young to really appreciate the game but kids in their "tweens" or a bit younger are probably the right age group. The game has a pretty basic plot on the surface. Some evil dude in a book decides to kidnap your friend and you have to go and rescue him/her/it (hey there's nothing to stop you from making your friend a ham sandwich). As you progress through the game you pick up pieces that reveals how the evil dude came to be, which I think is a nice touch (it makes him seem more human) but ultimately, the plot is still very much something that's taken a backseat to the actual gameplay. Okay, so what's the game all about? Well when you first start you get some basic drawing tools to create your own stickman! This is probably the best aspect of the game, especially once you incorporate your stickman into the game. You have a few colours to choose from but eventually unlock more as you progress through the levels. You're also able to draw a friend that will be kidnapped by the game's villain but sadly you don't get the same tools to design your friend as you do when creating your own stickman (i.e. only one colour instead of multiple). Right, well once that's done it's time for the game proper. You'll have to solve a bunch of puzzles on each level in order to progress and the only tools available to you are magic pencils. You'll be given access to different magic pencils depending on the level, for example on the very first level you're introduced to the fire magic pencil. To use the pencil, you click on the pencil graphic on the right and then draw a shape somewhere on the screen, preferably something that resembles fire but hey you can make as much or little effort as you want. Sadly, I found that after only a short time I found the ability to create tools or objects with the magic pencils in any shape or form nothing more than a gimmick that you'll get bored of quickly and I ended up just drawing lines in the interests of expediency. Of course, it might be a totally different case with a young child but I'm speaking from an adult's experience here. It also might work better on a mobile/touchscreen platform. Speaking of young kids appreciating the game more, that's another issue I have with the game: who is the target audience? Yes it does seem like this game would appeal to kids more since it encourages exploration and the ability to be creative in solving puzzles. However, the game seems too complex for younger kids at certain points since even I struggled in figuring out what to do. Also the game gives no indication if you've already failed a level once a required path is destroyed which is similar to what old Sierra adventure games used to do to you: "Hey Graham, remember that pie you ate a couple of hours ago because you were really starving? Well guess what? You needed to throw it at that yeti's face to stop him! Hahahaaa! Oh well, you can't finish the game now and will need to reload from an earlier save. What? What do you mean you don't have a previous save?" Anyway, you get my point. Finally, death in the game results in restarting the entire level. Since it's quite easy to die in this game this is likely to occur several times, the only godsend being how short the levels are in terms of duration. It's still annoying how they didn't at least introduce a checkpoint system once you completed a task correctly though. The game doesn't contain that many sound effects and the ones that are there are pretty basic - but it all fits this game's apparent target demographic I guess: kids. The game's got alright music thanks to the efforts of Matt Bitner. It's nothing I'd consider terribly memorable but it serves the purpose for what is effectively a mobile game. 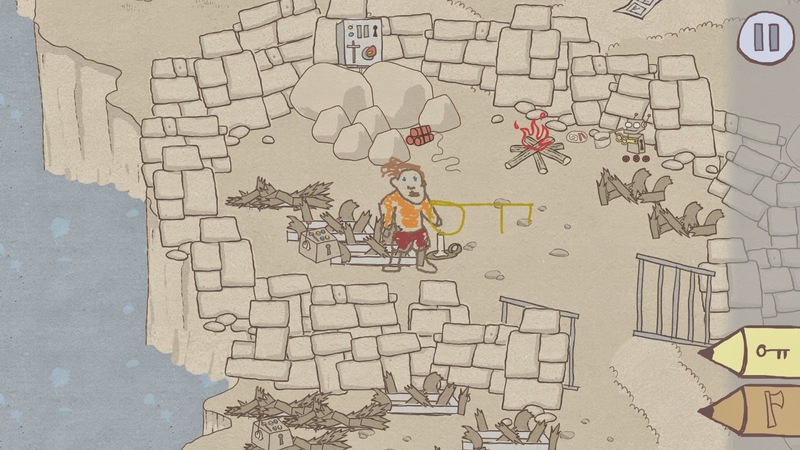 The game has some pretty rudimentary graphics considering they're all meant to look like things hastily drawn by a child but of course that also means that any stickman you draw will fit in seamlessly with the story. While the game has multiple ways to reach the final stage (which encourages replays) the game is also terribly short too, taking me less than two hours to finish the game (and that's after making several mistakes too). I didn't complete all the secondary puzzles though so there's probably an extra hour or two of gameplay there if you're a "completionist". No serious bugs in the game except that it's quite easy to get stuck in the terrain. There have been a few times where I've tried to run away from monsters only to get stuck in the terrain and die - very frustrating! 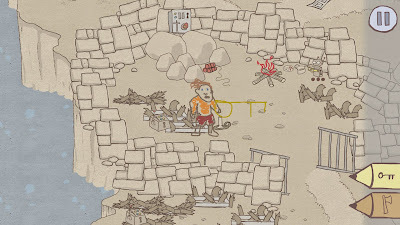 While creating your own stickman and tools for the first time is entertaining for a few minutes, the rest of the game becomes your typical puzzle game and the gimmick of drawing said tools wanes in popularity as the game draws to its conclusion. The game also straddles two demographics by being too childish for some adults yet too difficult for some kids. If you can get this game cheap it might be worth a couple of hours entertainment for a "tween" or child similar in age but then they might as well just buy the app on their smartphone, since I get the feeling it's likely superior on that platform when compared to the PC version.